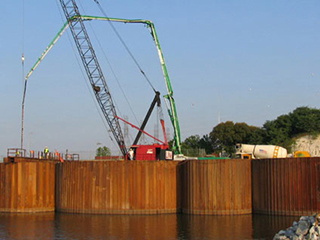 This project consisted of construction of a temporary cellular cofferdam to provide for the future construction of a new 1,200 lock adjacent to the existing lock. 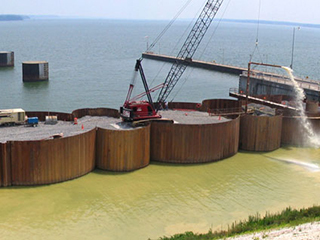 The work included construction of three 69′ diameter circular sheet-pile cells, with three connecting arc-cells and a sheet-pile land-side tie-in wall. Each cell required a tremie-placed mass concrete base plug, the largest of which required approximately 3000 cubic yards. 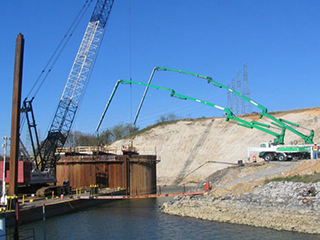 The project also included underwater placement of concrete for modifications to the existing lock wall at the tie-in point. 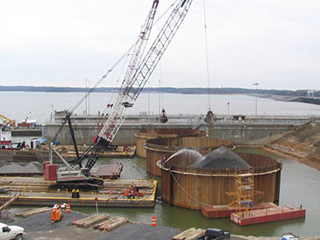 A total of 9,400 cubic yards of underwater concrete was placed on this job.